The Barnett's Laptop Hoop Frame allows you to hand quilt and use both hands with ease. This light-weight, sturdy, hand quilting lap frame elevates your work to a comfortable height, while the hoop tightens firmly on your project. No more holding the hoop with one hand or between your legs! No more back or neck pain. The small, compact size of this lap frame makes it easy to store away or take to a class. Laptop Hoops is a small family operated business. We are so confident in how well our lap frames will work for you, we will give you 60 days to try it out. After using one of our quilting lap frames, from our experience - you will show it to your friends and they will order one too! You will love this little lap frame. In addition check out our HUGE selection of quilting books, thimbles, needles and other quilting supplies. Many years ago when I was just a little kid, my mother asked my dad to make a lap frame for her quilt projects. My father was extremely handy and spent a few days trying different designs and finally came up with the laptop hoop frame you see here. My mom, Pauline Barnett, brought the hoop frame to her quilt guild and it was a hit. Orders started coming in and my dad had a little part time business in the basement workshop. Unfortunately my parents are no longer with us. While going through my dad's workshop I found some of the parts that make the hoop frames. I stored them away for a few years in my attic and they collected dust. 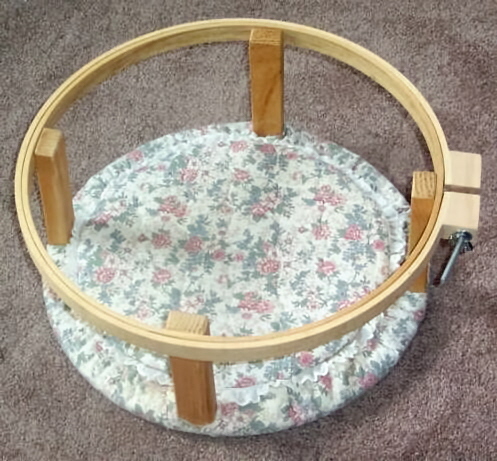 It wasn't until years later when I was cleaning my attic, making room for a workshop of my own, that I found the parts and assembled my first Barnett's Laptop Hoop Frame. It looked good, so I put it on www.ebay.com and wouldn't you know it...I had a bidding war. A new business was born! It is now a few years later and we have refined the design drastically and have sold too many to count to happy customers. My shop has moved from the attic to a new shed in the back yard. I have a few new employees too. My 5 year old son, Harrison and my 13 year old daughter, Taylor helps assemble them from time to time. Hayley, age 12, does our demo videos and sanding and Payton, age 4, just supervises us working. We hope you enjoy shopping both our extensive book selection and our unique frames. Take a moment to sign one of our many Guest Books to leave us a message.